Some of the major players active in the video analytics market are Puretech Systems, Honeywell International Incorporation, Allgovision Technologies, Agent Video Intelligence, IBM, Axis Communications, Genetec Inc., Intellivision Technologies, Aventura Technologies, Avigilon Corporation, Cisco System, and Intuvision, Inc. among others. These players are set to power the development of video analytics market. As per the report by Zion Market Research, the global video analytics market added up for almost USD 1.89 Billion in 2016. 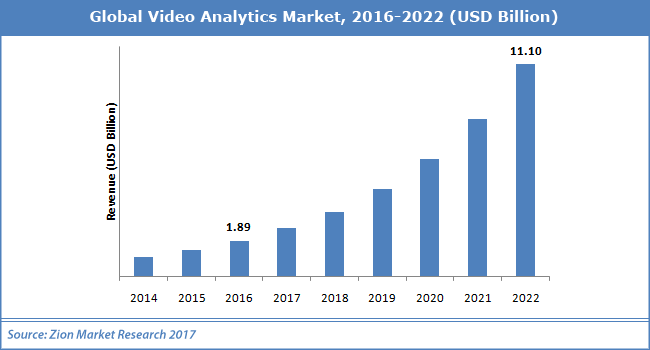 The video analytics market is likely to cross almost USD 11.10 Billion by end of 2022, developing at a CAGR of almost 34.3% from 2017 to 2022. Increasing frequency & intensity of security breaches and terrorist attacks are likely to be the major boosting factors for video analytics market in coming years. Moreover, government investments in up-and-coming techs to improve public safety infrastructure, increasing requirement for enhanced security arrangements, demand for actionable insights, and the arrival of industrial automation are the major boosting factors estimated to flourish the development of video analytics market in the years to come. Placing of video surveillance cameras in public regions such as railway stations, airports, hospitals, hypermarkets, shopping malls, and hotels all over the world will add to the development of video analytics market massively. On the other hand, storage & bandwidth issues are likely to limit the growth of the video analytics market. Nevertheless, increasing inclination towards techs such as AI, IoT, and ML is likely to unlock new alluring avenues in the near future for the video analytics market. In addition to this, a new innovation by major players is also set to power the video analytics market. For example, in April 2017, Cisco Systems rolled out a video analytics software to enhance the public transport operators information about the passengers’ usage habits and nature by using the firm’s Ml abilities, thereby towering the video analytics market. The software is likely to come out as one of the most attractive type sectors in the forecast period in the video analytics market. Updated and advanced version of the software will power the development of type segment in the video analytics market in the forecast period. Service is also likely to turn out to be one more lucrative type sector in the years to come. Traffic monitoring and facial recognition are likely to emerge as a superior application division of the video analytics market. Rising requirement for actionable info insights will power this application segment in the video analytics market. Facial recognition is likely to develop with highest CAGR in the video analytics market during the analysis period.